The AutoSeal FD 2054, an innovative tabletop that can provide the premium pressure sensitive one-piece documents. 5 pre-programmed standard folds like panel C, V, Z and uneven C and Z folds. Up to 35 custom folds can be programmed into the machine and even the fold types can be modified individually. 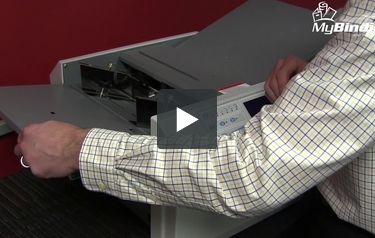 In operation, the FD 2054 is capable to detect and adjust automatically to the variety of document forms. Feature a drop-in three-roller feed system capable to process at the speed of up to 16,450 per hour. An estimated monthly cycle can be up to 200,000 forms. Large, 2.8" LCD screen with an advance and incredible easy control panel system design for any inexperienced operators to begin with no instruction. Changing stacker wheels by hand is a thing of the past, with the AutoStack Wheels, switching form sizes and fold types are as easy as 1-2-3. To clear from distraction, the top and side covers are fully insulated to decrease the operating noise. Work smarter with the Formax FD 2054 AutoSeal Pressure Sealer. Welcome to MyBinding video. This is a look at the Formax FD 2054, an AutoSeal Pressure Sealer. From one sheet to stacks of sheets, this innovative tabletop folder is a workhorse. It’s super simple to use. It has 5 preprogrammed standard folds, both even and uneven, and up to 35 custom programs can be programmed into the machine for your office needs. It can detect and automatically adjust the type of paper and size of paper and its output is staggeringly fast at 16,450 sheets per hour. An estimated monthly cycle can be up to 200,000 forms. Controls have an extra large LCD panel and easy to push buttons that make intuitive sense. With both auto batch as well as full control of all batch sizes and runs. Setup and assembly is simple and quick and changing stacker wheels by hand is a thing of the past with auto stack wheels and heavy option of adding a bypass feeder for stapled items. And that’s the Formax FD 2054. For more demos, reviews and how to’s, check out MyBinding.com. Welcome to another MyBinding How To video. 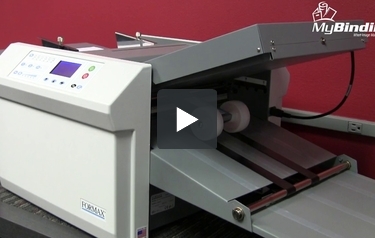 This is a simple and quick video on how to setup your Formax FD 2054 AutoSeal Pressure Sealer. With the machine unplugged from the wall, let’s start with putting on the folder unit. With the cord facing toward the back, slide it right into the slot on the right hand side and then plug it in. Align those pins so they go just in easy. Tipping the left backside up just a little bit, you can pull out the tray. It just simply lifts up and slides into place, and then put the back folder in, sliding in on the bottom just up until it clicks into place and then plug it in as well. Make sure the machine is nice and level on a flat, sturdy surface and you’re all set. The power switch is just here on the left hand side when you’re ready to begin and as needed, you can extend the output tray. That’s all there is to assembling your FD 2054 by Formax. For more demos, reviews and how to’s, check out MyBinding.com.